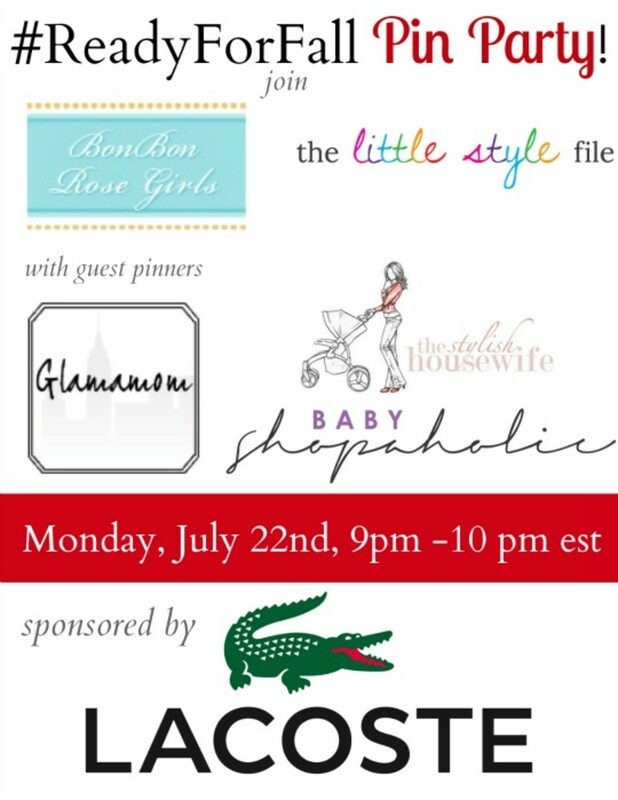 Join us for the Lacoste Pinterest Party 7/22 hosted by BonBon Rose Girls and The Little Style File, with guest pinners Glamamom, The Stylish Housewife & Baby Shopaholic, for a fashion-filled hour of prizes. Are you guys on Pinterest yet? You&apos;d better be! It&apos;s growing rapidly and an amazing source of inspiration from interior design to birthday parties. And if you&apos;re a blogger, you&apos;ll probably be interested to know that Pinterest now drives more traffic to this site than Facebook, and I&apos;m not even hugely active. WHAAAAAT? All true. I&apos;m guest pinning at another Pinterest Party hosted by BonBon Rose Girls and The Little Style File, along with fellow guest pinners The Stylish Housewife and Baby Shopaholic to bring you a fashion-filled party with prizes from Lacoste. Prizes: We will be giving away over $1000 in prizes including 3 pairs of Lacoste Berdine sneakers, (1) $250 Lacoste gift card, and (2) $100 Lacoste gift cards. Participating in a Pinterest party is easy as pie! To join: Create your own #ReadyForFall Pinterest board and pin during the party using the #ReadyForFall tag. Please repin at least 10 pins from our #ReadyForFall board, two of which must include the Lacoste Berdine sneakers in both colors (black/gray and brown/green) available at Nordstrom. To be eligible for prizes: You must FOLLOW our sponsor, Lacoste, on Pinterest and come back and leave the link to your #ReadyForFall Board using the Rafflecopter widget below ONCE THE PARTY STARTS! Please also follow the hosts Bon Bon Rose Girls and The Little Style File, sponsor Lacoste and guest pinners Glamamom, The Stylish Housewife and Baby Shopaholic. We&apos;ll be tweeting during the party too! Join us by using the hashtag #ReadyForFall! CLICK HERE. Winners will be randomly selected at the end of the party (10 pm EST) and notified by email as well as announced on Facebook and Twitter. Prizes are non-transferable. If you have questions about participating, please don&apos;t hesitate to contact us! We&apos;re pumped about partying with you!